The VITROMED clinic conducts a comprehensive ultrasonography (USG) of the internal organs with Dopplerometry on the expert class unit. Using modern ultrasound equipment (Samsung-Medison V20 Prestige) allows not only to obtain the most reliable results and accurate description of the state of organs and tissues, but also significantly reduce the total time of the survey to the final diagnosis. When the patient wants to get the whole medically assessment of the state of the liver, biliary system, spleen, retroperitoneal organs (pancreas, kidney, adrenal gland), pelvic organs (uterus and its appendages), surface-located structures (thyroid and mammary glands, organs of the scrotum). When ambiguous or contradictory clinical picture of the disease (according to the anamnesis, the patient's complaints , the results of laboratory analyzes and observations of clinicians) . To eliminate (or confirm) neoplastic lesions of the internal organs, as well as the extent of the process. If there is a known disease, to form the most complete picture of the prevalence and severity of violations, presence of possible complications to define or clarify further treatment and observation tactics. To monitor the effectiveness of conservative and surgical treatment. If you suspect the presence of any disease of the internal organs. The role of ultrasound in obstetrics and gynecology is invaluable. Holding ultrasound under preventive examinations can detect violations of the pelvic and breast in the early stages of development. This approach contributes to a significant reduction in the number of surgical interventions, and the treatment of gynecological diseases mainly is conservative therapy . Ultrasound in obstetrics allows to diagnose multiple and ectopic pregnancy, detect fetal malformations. 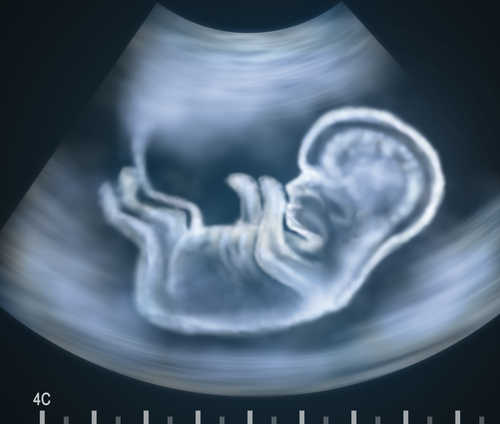 Dynamic ultrasound monitoring in obstetrics allows timely identification of fetal growth retardation and other variants of the course of pregnancy, requiring therapeutic measures. - availability and the length of the nasal bone (NB); normally at 12-13 weeks gestation it is 3 mm, and its lack is suspicion of Down syndrome. - pregnancy-associated plasma protein A (PAPP-A) in the norm of 11-12 weeks gestation is 0,79-4,76 mU/l , 12-13 weeks - 1,03-6,01 mU/l , 13 - 14 weeks - 1.47 - 8.54 mU/l, with Down syndrome and Edwards its level is reduced. Discrepancy between the results of the first trimester screening tests and standards is not talking about the need for immediate termination of pregnancy, but only indicates a possible risk that after the passage of the survey is calculated individually for each patient. If you suspect the presence of pathology in the fetus according screening raises the question of the in-depth (invasive) survey. The most reliable method of diagnosis is to study the chromosomes of fetal cells. To this end, they studies amniotic fluid (amniocentesis is performed), placental tissue (platsentocentesis), chorionic villus sampling (biopsy), fetal cord blood (cordocentesis). Ultrasonic methods of research up to date are among the most informative diagnostic methods that do not require the use of surgical instruments or make punctures. These methods are completely safe and reliable. Ultrasounds allow timely identification of diagnosis, which in turn allows the physician prescribe effective therapy and observe the changes of the patient throughout the treatment period. - ultrasound equipment does not emit radiation and gives you the opportunity to perform the procedure any number of times. Ultrasound diagnosis is performed for various diseases in all areas of medicine. It is used to clarify the diagnosis and detection of changes in organs and tissues. Importance ultrasound determined by the fact that disease can be identified until its clinical symptoms. 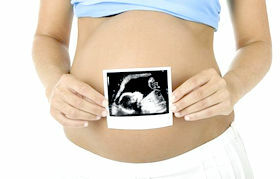 So, gynecological ultrasound able to determine the cause of infertility or tubal occlusion. Early diagnosis solves many problems in the treatment and rehabilitation of health. The program of screening ultrasound examination allows to check all the systems of the body. The clinic "VITROMED" a procedure of ultrasound and Dopplerometry are made at one visit. Having the results of the study, the doctor refers the patient to the profile expert. If structural changes in state of organs and tissues are found, the comprehensive preventive measures are proposed. This method is based on innovative technologies and is the result of joint work of doctors of "VITROMED" clinic and foreign specialists. This survey allows to determine the structure and size of organs, their location, the presence of inflammatory and additional entities, to identify chronic diseases, as well as changes caused by traumatic injuries. Reveals: hepatitis (acute and chronic), benign and malignant tumors, cirrhosis, changes caused by heart disease, parasitic cysts, fatty infiltration. Used to determine abnormal forms, change the position, size, biliary tract disease, presence of stones, inflammation, polyps, benign and malignant lesions. Diagnose pancreatitis and their complications, abnormal formation, inflammation and destruction of tumor and non-neoplastic nature. Determines the size of the organ, as well as its changes that have occurred due to liver disease, reveals cysts, tumors, sarcomas, lymphomas, leucosis, lymphangiomas, infarcts and abscesses. Study diagnoses hyperplasia, inflammation, tumors, cysts and hematomas; it assesses lymph node and blood vessels state. Comprehensive survey of the urinary system allows us to estimate the size, shape and contours of the bodies, the state of the parenchyma and collecting cavities, the presence of third-party entities. Variety of abnormalities, inflammation, tumors, and urolithiasis are determined. Gynecological ultrasound and ultrasound with Dopplerometry diagnose inflammation of the uterus, ovaries, fibroids, tumors, blood disorders and fetal pelvic internal endometriosis and endometrial pathology. Approximately 8% of the adult population has thyroid disease in varying degrees. Malignant tumor of the thyroid gland - is 3 % of total cancers. Diagnosis by ultrasound reveals about 100 % change in the thyroid gland and 93 % of cancer foci. Thyroid ultrasound determines the condition, size, structure of cancer in general, its internal changes and the quality of relationships with other entities. Revealed a variety of abnormalities, pathology, signs of thyroiditis, tumors, adenomas. Breast ultrasound is indicated for the diagnosis of mastitis, lipoma, fibroadenoma and malignant neoplasms. With the help of ultrasound specialist produces puncture suspicious areas that are not usually determined by palpation. Some types of research, including ultrasound with Dopplerometry require pretreatment of patient. So, for 6-8 hours prior to the examination of the abdominal cavity, it is necessary to eliminate the meal. And in the case of increased gas observe a three-day diet with activated charcoal after eating. In the case of ultrasound of bladder you have to drink 1 liter of water before 2 hours the procedure. A transvaginal study, bladder must be emptied.